Microdermabrasion in Brisbane is one of the most recent skin-care therapies to have crossed over from Hollywood to the mainstream. It’s being advanced as an “instant facelift” an effective alternative to costlier and more invasive procedures like plastic surgery, chemical peels and Botox injections. Recently, more and more men and women are trying it, instead of pursuing cosmetic surgery. So what exactly is microdermabrasion, what does it promise and what effect does it actually have on your face? Do you need a doctor, or is it something you can do yourself? In this article, we’ll look at the science behind microdermabrasion, see what a treatment is like and find out what it does to your skin. Microdermabrasion is a general term for the application of tiny rough grains to buff away the surface layer of skin. Many different products and treatments use this method, including medical procedures, salon treatments and creams and scrubs that you apply yourself at home; and we also offer Microdermabrasion in Brisbane. It’s usually done to the face, chest, neck, arms or hands. Before we can understand how microdermabrasion does what it does, it’s important to understand how skin works. Our skin is made up of two main layers, the epidermis and the dermis. The epidermis is the layer closest to the outside world. It’s a set of dead skin cells on top of another layer of cells that are in the process of maturing. The topmost layer is called the stratum corneum. The stratum corneum mostly acts as a barrier between the outside world and the lower skin layers. It prevents even the smallest molecules from getting through. When you put lotions or creams on your skin, some of the moisture passes through the stratum corneum, but not all of it. This layer is home to many minor skin imperfections like fine wrinkle lines and blemishes. All such issues can be dealt through Microdermabrasion Brisbane. All of the action in microdermabrasion takes place at the level of the stratum corneum. Since it only really targets the epidermis (and not the dermis), it is more accurate to call it micro-epi-dermabrasion. Affecting deeper layers of skin would be painful and harmful, and it would risk permanently embedding the tiny grains into the skin. And we are bringing forth Microdermabrasion in Brisbane, to offer advanced skin treatment. Microdermabrasion is the system of pushing specially refined crystals at high velocity onto the surface of the skin to exfoliate dead skin cells and promote the generation of new skin cells, thereby creating a skin surface which is youthful and glowing. The vacuum suction nozzle performing a dual role: to suction the skin and promote lymphatic drainage and to remove excess crystals and abraded skin cells. This procedure can be used to treat a number of skin conditions and complaints, and results can be seen following just one treatment. As further treatments are undertaken, results become even clearer to see and feel. Microdermabrasion in Brisbane that we offer can be used as a standalone treatment or as a profitable addition to almost any other facial treatment offered. What skin conditions and complaints can microdermabrasion treat? For optimum skin results, how many treatments are recommended? We guarantee visible improvements with 6 Microdermabrasion in Brisbane skin treatments. That is one treatment per week for six weeks in a course of treatments. Naturally, maintenance is a great idea with one treatment per month once one has achieved the desired skin result. Microdermabrasion is an chemical-free, non-invasive procedure of face cleansing that involves the use of a spray of exfoliating microcrystals to remove the outer layer of dryness and dead skin cells to reveal younger, healthier and smoother skin. Microdermabrasion is a pain free and fruitful method of removing the top most layer of the skin for restoring the skin’s freshness. 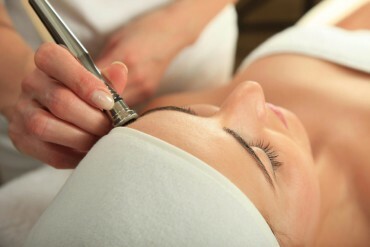 Shailly Hair & Beauty offers excellent Microdermabrasion services in Brisbane.